True fact: I love pasta so much that I’d never bothered trying zoodles (aka spiralized zucchini noodles) until a few months ago. True fact: I tried them recently and was really surprised by how much I liked them. I was almost DISAPPOINTED by how much I liked them. Happiness is a tricky beast, you know? 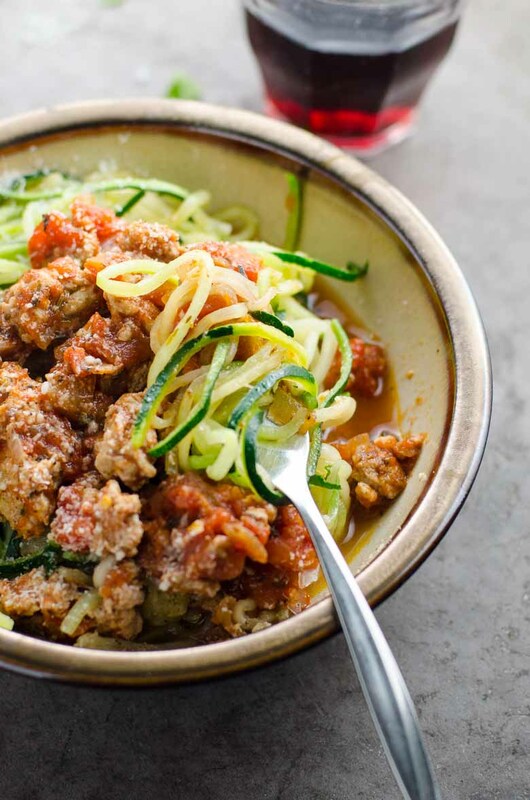 True fact: Turkey bolognese is another top-notch way to dress zucchini noodles, AND it has the distinction of being very likely the last zoodles recipe I’ll post here for a good long time. They’re yummy, and you should make these. But let’s not get ridiculous. You need to leave some room in your diet for pasta. Successful zucchini noodles are all about two key techniques: proper drying and aggressive seasoning. Read on to learn how to do it. 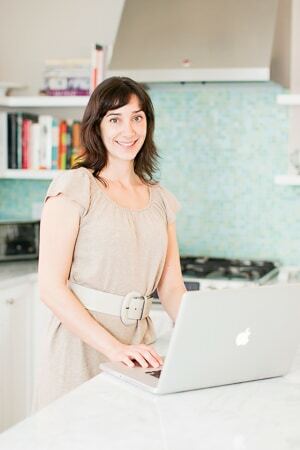 Here’s the smart method of drying zoodles that I recommend. About half an hour before you want to eat, spread the zoodles on a thick layer of paper towels, salt them lightly, and then cover with another thick layer of paper towels. Let them sit until you’re ready to toss the noodles into the pan. They’ll release a lot of moisture. Right before adding to the pan, roll up the whole bundle and squeeze a bit to make sure all the moisture gets absorbed into the paper towels. 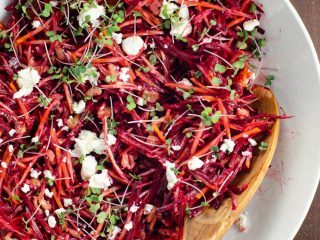 In the market for a spiralizer? If you’re in the market for a spiralizer, I’ve used both this one and this one (for those of you with a KitchenAid mixer), and both work just fine. 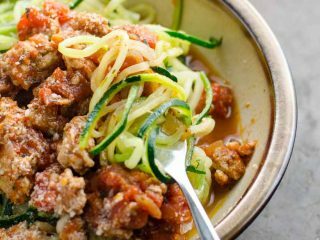 True fact: Turkey bolognese is a top-notch way to dress zucchini noodles, AND it has the distinction of being very likely the last zoodles recipe I’ll post here for a good long time. They’re yummy, and you should make these. But let’s not get ridiculous. You need to leave some room in your diet for pasta. Arrange the zoodles on a double layer of paper towels. Sprinkle with a little bit of salt. Cover with a double layer of paper towels and press gently. Leave while you make the sauce. In a 12-inch frying pan, heat the oil over medium-high heat. Add the onion, garlic and turkey and sprinkle with 1 teaspoon salt. Cook, stirring from time to time to break up the meat into bite-sized pieces, until turkey is cooked through and nicely browned in spots, about five minutes. Add tomatoes, fennel, basil, thyme, oregano and red pepper flakes to pan and stir to incorporate. Reduce heat and simmer for about 10 minutes, until nice and thick. When ready to serve, give the zoodles a gentle squeeze between paper towels to remove as much moisture as possible. Warm the remaining teaspoon olive oil in a second frying pan. 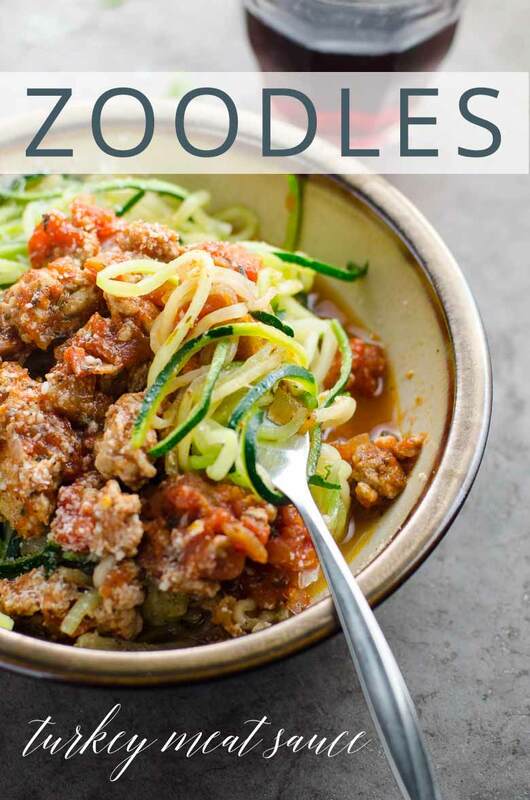 Add zoodles to frying pan and cook, tossing with tongs or a rubber spatula, for about a minute. They should retain a nice bite but not look raw. Divide zoodles among four bowls and top with sauce. Garnish with pepper, cheese and parsley, and serve.